TIP #1: In my humble 20 years experience, the deposit fee is the single best thing that has happened in my studio. A Non-Refundable Deposit equals retention and immediately weeds out students who will have problems paying. 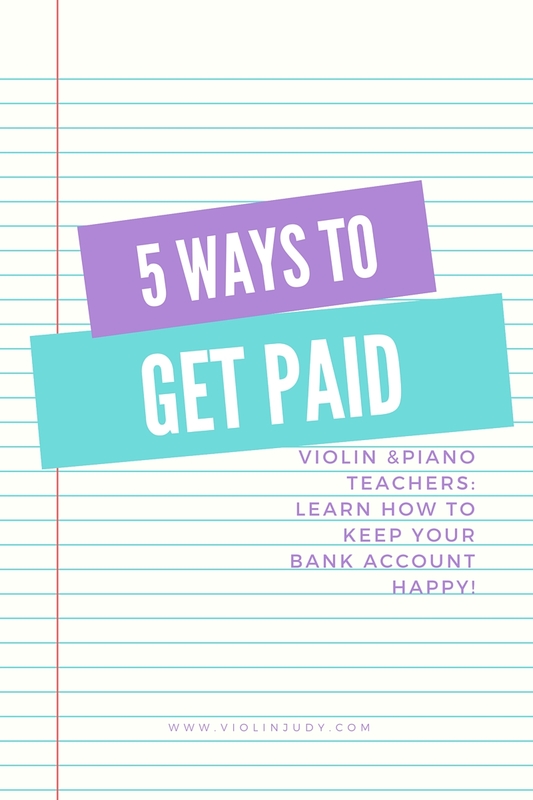 Unless you are teaching piano lessons as a hobby, most of us NEED to be paid on time in order to provide for ourselves, our families, and we need to pay our bills and meet our commitments on time! I charge $30/year for the first year’s non refundable deposit per student and $10 per year per student after that. You may charge more, depending on what you provide your students and the area you live in. ~3 Ring Binder used to store theory worksheets or Music I print from a studio license. The Deposit fee has a psychological effect as well. No one wants to jump ship once they’ve paid the fee. Timmy is GOING to take piano lessons for a year! Tip #2: Charge a Late Fee. Pick a universal fee that is unpleasantly high and charge it to EVERYONE EVERY SINGLE TIME with no exceptions. Tip #5: RENT OUT INSTRUMENTS. If you have been teaching long enough, you may already have quite a collection of violins and or pianos living under couches, hanging out in spare bedrooms, ect. and why NOT put them to good use? If you don’t there is NOTHING wrong with heading to yard sales to find some amazing deals on keyboards.